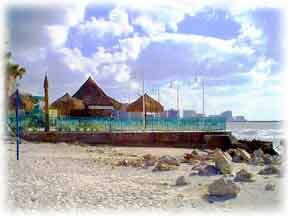 When visiting Clearwater one of the best places to be is at the beach. The beaches of Clearwater are rated in the top ten of "the beach list." The fantastic beaches are located on thin barrier islands separating the Gulf of Mexico from the mainland. 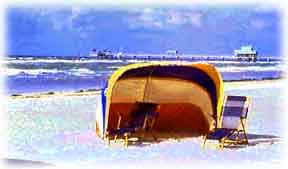 Clearwater Beach has a gentle surf slapping against miles of white sandy shores. The beach has lifeguards during the daytime hours. The beach has a concession stand, showers, restrooms and rental equipment. Try your hand at beach volleyball at no charge. Parking is available and there is a minimal charge. North of Pier-60 you can rent sailboats, personal watercraft vehicles and go parasailing. A festival is held two hours before sunset at Pier 60 all year. Mingle with local crafters, artists and performers at the nightly entertainment. Purchase a handcrafted souvenir or watch a mime. The old fishing pier at North Clearwater Beach is now an observation deck. Cabanas and umbrellas are available for rent near restrooms and showers. The Palm Pavilion has concession stands. 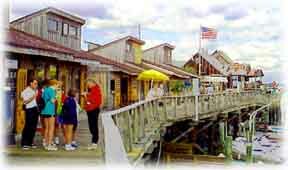 Shops and restaurants are within walking distance from the beach. Metered parking is also available. The Jolley Trolley services North Clearwater Beach and Clearwater Beach. It�s not only for newly weds as the name implies. Joggers, swimmers, naturalist and fishing enthusiast swarm to Honeymoon Island State recreation area. Swimming is fantastic in the warm gulf waters. Enjoy a quiet picnic and stroll through the natural habitat. Drop your hook, line and sinker into Hurricane Pass or try casting a line into the surf. Hop on a ferry to the magnificent Caladesi Island. In the Spring Clearwater sponsors the "Clearwater Fun & Sun Festival." The festivities last two weeks with parades, concerts, road rallies, races, sports, craft shows, car shows and a variety of delicious foods. Caladesi Island is accessible by ferry or private boat. Several miles of white sandy beaches border the Gulf of Mexico. The park offers interpretive programs for the public and quiet nature trails. Birds flock to the area to live and breed in the natural vegetation and secure surroundings. 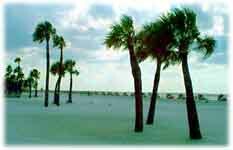 The 65-acre park Sand Key Park Beach is rated in the top 14 of "beaches." 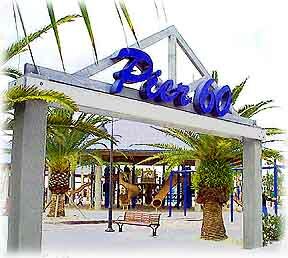 It is operated by the Pinellas County park system and is open daily. Metered parking is available and the Jolley Trolley services the area. Information on the Jolley Trolley can be obtained by calling (813) 445-1200. Facilities include showers, restrooms, picnic grounds and lifeguards making this park a great place to swim, jog, fish, relax and collect shells. The city of Clearwater will host Military Appreciation Day on Saturday, November 8 at Sand Key and Clearwater Beach. An entire day of activities honors our military personnel. Station Square Park is host to the fabulous Farmer�s Market that runs from October through May. Every Saturday on the north side of Cleveland Street visitors will find fresh fruits, vegetables and bakery items. Hand crafted items including paintings can be purchased from local artists. Music lingers in the air mixed with the aroma of spices and fresh bread.